This section offers general information about the history, purpose and management of PID 6. PID stands for Property Improvement District. A PID is a public entity administered by the City of Fort Worth for improvements, projects and special supplemental services over and above those normally provided by the city. PID 6 is located in the City of Fort Worth, North East Tarrant County, North Central Texas. The city has approximately 599,000 residents and 313 square miles. PID 6 is a few miles South West of Alliance Airport and Texas Motor Speedway. Nearby major highways include Interstate 35W and Interstate 820. A PID is formed by petition of the property owners in the proposed district. It is a self-imposed tax to pay for enhanced services and/or improvements in the district that benefit not only the individual property owners, but also the entire city. You can find out more information by reading the PID Guidelines. Hillwood Development Corporation built the Park Glen Addition. The company established PID 2 in 1988 and PID 4 in 1990. In 1998, the property owners petitioned to combine PIDs 2 and 4 into PID 6. 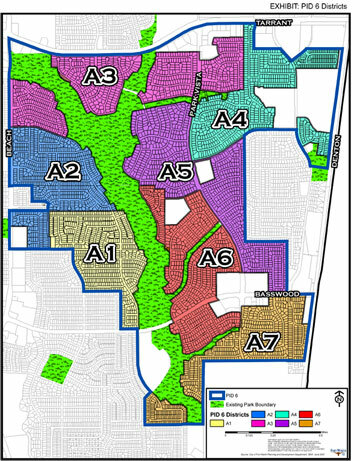 Some adjoining neighborhoods, built by a different developers, were deemed to benefit from the district in general and were included in the PID 6 petition. The petition forming PID 6 specifically requested that City Council NOT appoint an Advisory Board to the district. Rather, the Advisory Board was to be composed of representatives of the various neighborhood associations formed within the boundaries of PID 6. Neighborhoods that fall under PID 6’s umbrella are Park Glen, Parkway at Park Glen, Park Place, Parkway Hill, Parkwood Estates, Summerbrook, Basswood Park, Park Bend and Villages of Parkwood Hill. PID 6 is located in Fort Worth City Council District 4, represented by Councilmember Cary Moon. Click on the image to view the PID 6 districts (labelled A1 to A7). Advisory Board The Advisory Board represents the neighborhoods. The PID is divided into 7 districts to provide equal representation based on the number of houses. Each district has an Advisory Board member. The primary benefit is to provide the assurance of maintaining or increasing property values by a continually maintaining and improving the properties and their surroundings. When PID tax dollars are collected by the City of Fort Worth, they are earmarked for the PID. All that money is guaranteed to be spent on improvements and/or maintenance within the PID district. Neighborhoods do not need to beg, fight and plead with the city every time they want money for an improvement for their neighborhood. What happens if you do not have a PID? The answer is obvious! Take a look at other residential areas and compare what the development looks like a few years after the builders leave. Belonging to a PID is a good thing. On PID 6 public property, services include turf maintenance, mowing, edging, fertilizing, horticultural maintenance, tree care, seasonal color, tree and plant replacement, irrigation, water, electricity, special fence maintenance, ground and holiday lighting, park improvements, trash pickup in parks, and off-duty police patrols. PID 6 does NOT take care of the resident's property or services such as street repairs, street light maintenance and utility services/repair. Assessment All property owners pay an annual assessment which is billed and collected by the Tarrant County Tax Office. The current PID is $0.175 per $100 of assessed value. >Financials The budget submitted by the PID Manager to the Fort Worth City Council is finalized annually based on the costs. Financial reports are published on this website. The City of Fort Worth is ultimately responsible for the PID operations. However, the city contracts the management of the daily operations to a property management company. The PID Manager is responsible for supervising the contractors, preparing work summary reports, submitting annual budget and service plan, and addressing concerns raised by members of the district. The PID 6 District Association (Advisory Board) will work with the PID Manager to address concerns of district members. FirstService Residential is the current property management company for PID 6.